Home > Blog > Get More From Asparagus! 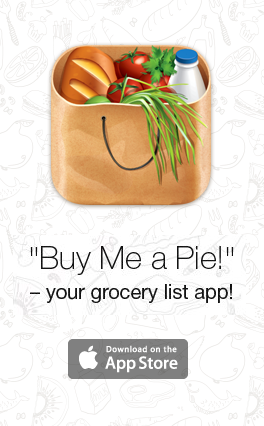 Share the post "Get More From Asparagus!" This highly versatile vegetable, packed with fiber, vitamins and minerals, comes in shades of green, purple and white. The purple spears will turn to green when cooked. Lots of people assume that white asparagus has been genetically modified, but this is wrong. The reason it stays white is because it grows underground, so the spears are protected from daylight. Green asparagus is generally thought to have a punchier, grass-like flavour than the more subtle taste of the purple and white variety. 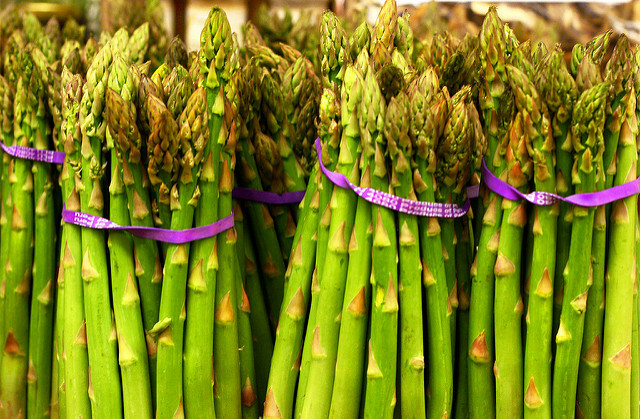 Once asparagus is established, the spears can grow as much as 6 inches a day! If the asparagus has tough, woody ends you will need to trim these off before cooking. Plain asparagus make an excellent accompaniment to a meat dish. Simply boil for 3-5 minutes, or steam for 5 minutes. Sprinkle with freshly ground black pepper and serve. Roast asparagus is a firm favorite with food lovers around the world. Lay the spears on a baking tray, drizzle with olive oil, and roast in a hot oven (450 degrees F/230 degrees C) for between 8 to 15 minutes, depending on the thickness of the stalks. 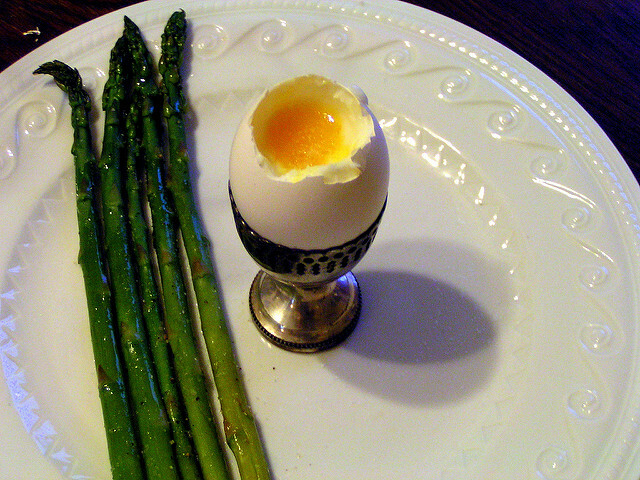 This is delicious dipped in soft boiled eggs, or try it with quail’s eggs for a special treat! Asparagus is great if you want to serve an easy, sophisticated-looking starter. Wrap bundles of 3-5 spears in delicious, flavorsome Parma ham. Sprinkle with olive oil, shavings of parmesan, sea salt and freshly ground black pepper. Roast for 10-15 minutes and serve with a drizzle of lemon juice or balsamic. Heat the olive oil in a small frying pan and cook the chopped ham until crispy. Boil the pasta in the usual way. Two minutes before the pasta is cooked, add the trimmed asparagus spears, cut into one-inch pieces. Bring to the boil and cook for a further 2 minutes. Drain, and stir in the crispy ham, ricotta cheese, lemon zest and juice. Sprinkle with the parmesan and serve.